Each family member—from grandparent to pup—is illustrated with your choice of traits and clothing. Celebrate your unique family with Mary and Shelly Klein's contemporary take on the Victorian group portrait. 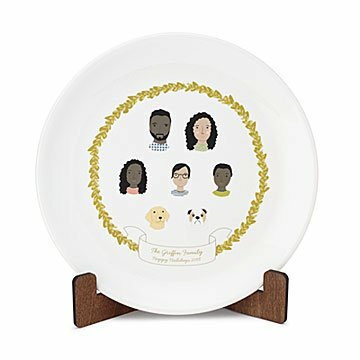 For this porcelain plate, each family member—from grandparent to pup—is illustrated with your choice of traits and clothing. The decorative cameo border features a banner with your family name, special date, and a message, making it a charming keepsake for the person in your life who can't get enough of their special bunch. Wood stand included. Made in the US. Mother-daughter team Mary and Shelly Klein like to put family front and center. The sweet, personalized illustrations of kids, couples, and furry friends that adorn their home decor items are drawn by Shelly, who is a painter. Each piece is handmade in their Grand Rapids, Michigan studio using sustainable manufacturing practices, natural hemp, organic cotton, recycled wool, and natural feathers.